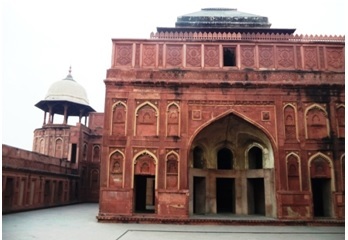 The Akbari Mahals are perhaps one of the oldest mansions in the Agra fort lying in the South-eastern part of the fort complex. These mansions are in ruins and very few could be seen in their original form. Yet we did have a nice time around them. As indicated by our guide, this palace complex was once the residential mahals belonging to the great emperor built around 1565 to 1569. There is enough evidence of the location of the harem complex in the western part of these mansions. There is another noteworthy mansion known as the “Bengali Burj” located to the south-east of the Akbari mansions comprising of square halls with arched aisles. It is said that the emperor gave the tender to the architects from Bengal to build these monuments. The influence of contemporary architectural features prevalent in the then Bengal are found in these mansions. 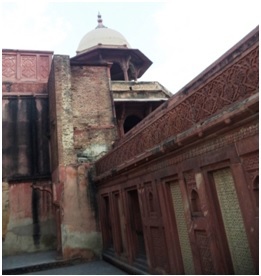 There is clear indication from these ruined mansions, how important they were during the rule of Akbar. 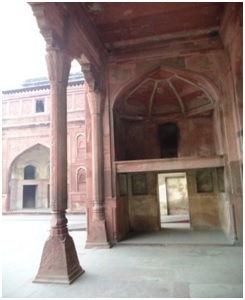 It is said that during the rule of Shah Jahan most of the red sandstone mansions built by Akbar were either demolished or modified into all-white marble palaces. Abul Fath Jallaluddin Md Akbar was born on October, 1542. He was the son of the second Mughal emperor Humayun and his begum Hamida Banu. He achieved remarkable glory that perhaps changed the course of the Indian medieval history. His philosophy, religious tolerance acted as a medicine in the cast-creed infected medieval India. The aura of love and harmony spread by Akbar the great laid the strong foundation of the Mughal empire in Hindusthan. Unlike his ancestors his works and military pursuits never reflected the attitude ‘I am unknown here, I am an invader, I am here to conquer and go away’. Akbar believed that he was a true Hindusthani monarch and it was his destiny to rule the empire for making it a better, unified Hindustan. His philosophy reflected on his military campaigns, political policies, architectural achievements and attempts to ensure religious harmony in the empire. Akbar reflected his philosophy of love and harmony throughout his political and personal life. He believed that Hindus also had same rights as that of the Muslims in Hindustan. He abolished Jijia Tax which imposed on the Hindus by the earlier Muslim rulers. His principal wife Jodha Bai, was the hindu Rajput princess of Amber (Jaipur) who gave birth to the next mughal emperor Jahangir (Salim). Todarmal was his chief controller and revenue minister, Mansingh was his Chief Army General, Birbal, Tansen and Vagwan Das were bright members of the Navaratnas in his royal court. He never distinguished people on the basis of their religious difference. It was during his reign when the Bhaakti Movement of the Hindus and the Sufi Movement of the Muslims reached the pinnacle of success. He ordered his scholars to translate Mahabharata in the Persian language. Under his encouragement Barini after four years of continuous hard work completed the translation of Ramayana in Persian language. Hazi Ibrahim translated Atharbo Veda and Fauzi translated the mathematical formulas of Lilabati. Who knows these great achievements were perhaps made in these Akbari Mahals through which we were wandering.